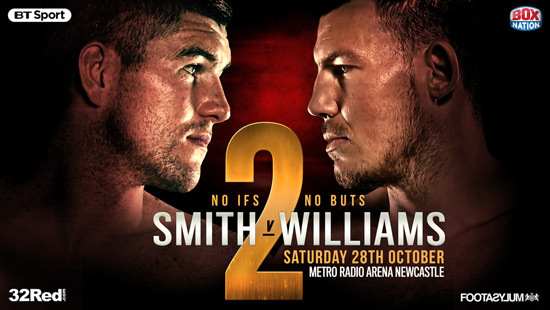 After their epic first encounter ended in controversial fashion, former WBO World Super Welterweight Champion Liam Smith and reigning British Super Welterweight Champion Liam Williams, will aim to settle the score on neutral ground at Newcastle’s Metro Arena, in a WBO World Title Eliminator on Saturday 28th October, simulcast live on BT Sport and BoxNation. On the night, Liverpool man Smith claimed the win after Williams’ trainer Gary Lockett deemed that the Welshman could not continue after being badly cut by a clash of heads. However Williams felt he had built up a large lead at the point the fight was stopped and tempers have flared ever since about the controversial circumstances of the fight’s ending, with Smith instead believing that the cut prevented him from seizing an inevitable late stoppage in the fight. Promoter Frank Warren said ‘I’m delighted to bring this huge rematch to Newcastle which is a city with a rich tradition of big fight nights. In the past I have bought shows with Ricky Hatton, Joe Calzaghe, Nigel Benn and Prince Nasseem Hamed to Newcastle and I’m sure this is set to rival the very best that we’ve done there. The undercard at Metro Arena is set to feature some of the very best emerging local North East talent, as well as some other excellent young fighters from further afield. Country Durham’s Thomas Patrick Ward (20-0) will defend his British Super Bantamweight Championship against Brimingham’s Sean Davis (13-1-0); whilst Guisborough’s Josh Leather (12-0) will face Sunderland’s Glen Foot (20-1-0) in a what is set to be a pulsating North East Derby for the IBF European Super Lightweight Championship. 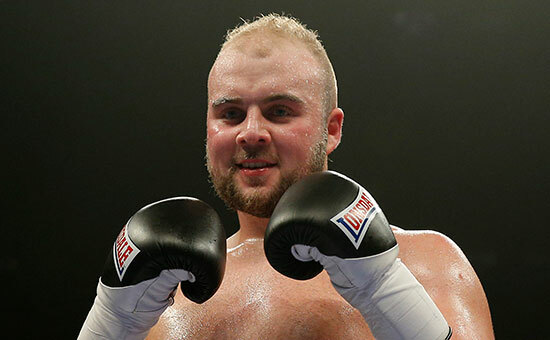 Ricky Hatton trained Nathan Gorman (Natwich, 10-0) will face Nick Webb (Chertsey, 11-0) for the English Heavyweight Championship in another showdown where someone’s ‘0’ is set to go. Mark Heffron (Oldham, 16-0) another of Ricky Hatton’s excellent young stable of fighters, will also be in action on the card. In addition, local prospects Troy Williamson (Darlington, 3-0) Kalam Leather (Guisborough, 2-0) Joe Maphosa (Thornaby, 1-0) Michael Watson (Sedgefield, Pro debut) and Jeff Saunders (11-0) of Sedgefield will all appear on the bill. A press conference and ticket information will follow within the next fortnight.